This is our second lesson in Ame-no-Ukihashi, the martial art of the Ninzuwu. If you have not done so already, we strongly advise that you review the first lesson on Ame-no-Ukihashi, The First Hiragana Form and the Heaven Trigram-Qian, before reading this second lesson. 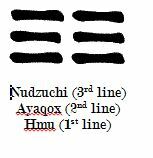 The second martial form in Ame-no-Ukihashi, the hiragana i. 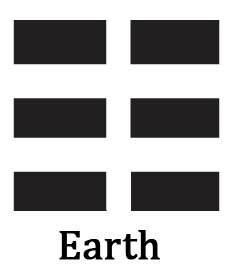 Looking at the trigram it seems to represent two Heaven trigrams standing side by side. We are reminded of the passage in the Nihon Shoki that speaks about divine beings that were produced between Heaven and Earth. Another interesting point about this is that while the ancient Shinto records describe the first of these divine beings as male, Heaven itself is feminine in nature, as well as Earth. This principle is replicated in human reproduction. After conception, the human embryo develops as a female. Only after 6-8 weeks does the Y chromosome kick in and the fetus begins developing male characteristics. This is reflected in the second hiragana, which is no more than the Earth trigram itself. If you notice the first stroke is on the female side, or left side, that being Heaven. Earth is also feminine. However, the first deities between Heaven and Earth were male. This was understood in ancient esoteric science and led to the development of the Mother-Son cults. The second martial form in the Ame-no-Ukihashi system. 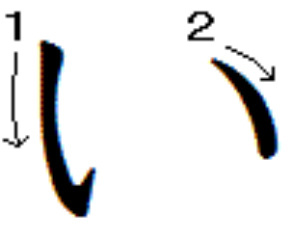 Hiragana i. The Ayaqox is a force that is lust in itself and is able to cultivate the lust in itself in order to transform it into love. What cannot transform lust into love is eventually disregarded as the lust fuels out the principle which embodies such uncultivated lust, dies. This is why the Ayagox is also said to appear as a praying mantis. The Stone Bowl of Eternity is the wisdom of the Yi Jing itself. This is given to the Initiate as he/she learns how to communicate with the abstract energy of the sexual force. The polarities of the sexual force were inherited by Izanagi-no-Mikoto and Izanami-no-Mikoto. This information is covered thoroughly in the article entitled, Before The Big Bang: Modern Science Has Only Confirmed What Shinto Priests Knew Centuries Ago. Readers can click on the link below to observe our Lesson #2 video.